This photograph of Pilot Officer Bruce Little of 457 Sqn graced the front page of official RAAF magazine Wings dated May 11th 1943. 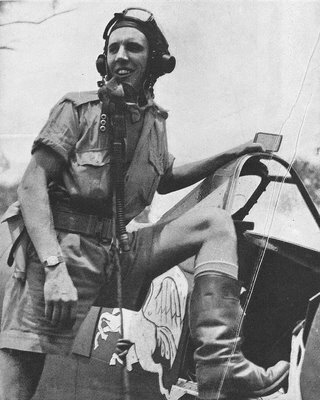 On the previous day of this issue, this young man had a very eventful first contact with Japanese fighters attempting to raid Millingimbi Island. Flying Spitfire Vc A58-81, coded ZP-S, he received damage that obliged him to hurriedly put down on Millingimbi’s east-west runway. Observing three Zeros strafing along the north-south runway, he realised his danger and immediately took off again, engaging in a fiercely twisting and turning fight with one of the enemy at extremely low altitude and scoring hits from 500 – 300 yards. The highly manoeuvrable Zero had little trouble out-turning Bruce’s Spitfire and was soon on his tail, though failing to hit him. It all came to a spectacular end when he found himself diving straight at the ground with no room for recovery, just managing to pull the nose up before impact at something like 200 m.p.h. Both wings and the tail unit were ripped off, but miraculously the fuselage remained intact to slither to a halt. Amazed to be still alive and unhurt, Bruce Little unstrapped, climbed out and walked back to base. The Zero was seen heading north with a very rough-running engine and correspondingly slow airspeed, and an explosion was heard shortly afterwards. With the subsequent report of an oil slick about a mile offshore, P/O Little was credited with a ‘probable’. Tough luck for the Zero pilot, but Bruce must have considered himself very fortunate indeed! Interestingly, the remains of A58-81 still exist in the hands of Mr. Bob Eastgate, who has it stored along with the remains of four other Spitfires at Point Cook, Victoria.